These savory pumpkin recipes are perfect for those times you want fall flavors that aren’t quite so sweet. I love pumpkin and often eat it year round. When I think of pumpkin I do usually think of sweet recipes first like pumpkin pie and bread, of course. But, it’s really great to use in savory dishes, too. Pumpkin not only tastes delicious but is quite healthy too being high in fiber and containing several vitamins and minerals. I love that these days it’s even available year-round at a fairly affordable price. Fresh Pumpkin Puree vs Canned Pumpkin – Which Is Best? Speaking of pumpkin being available year round, there’s always the debate of fresh pumpkin versus canned pumpkin. Honestly, I say use whatever you prefer and enjoy most. If you love going to the pumpkin patch or store and going through and finding the perfect pumpkin – go for it! It does take a while to prepare fresh pumpkin, though. You’ll need to cut the pumpkin open, scoop out the seeds and stringy pulp, then prepare the pumpkin and roast it for quite a while, though some boil or microwave it instead. Once it cools you’ll need to remove the softened flesh and then you can use it as desired. For me, it’s a bit much work to always go the fresh route, though it is awesome to have the seeds to roast for a delicious snack. Myself, I always have a couple cans of pumpkin in the pantry to use. It lasts a long time, is consistent in taste and texture, and is ready to go. I do think fresh tastes better, but it’s not always worth the extra work when I don’t have much time. What Savory Spices Go With Pumpkin? Pumpkin flavor pairings don’t always have to include a ton of sugar. Though even in savory dishes a little bit of sweetener like maple syrup or honey is a great addition. Here are some of my favorite savory spices that go with pumpkin. 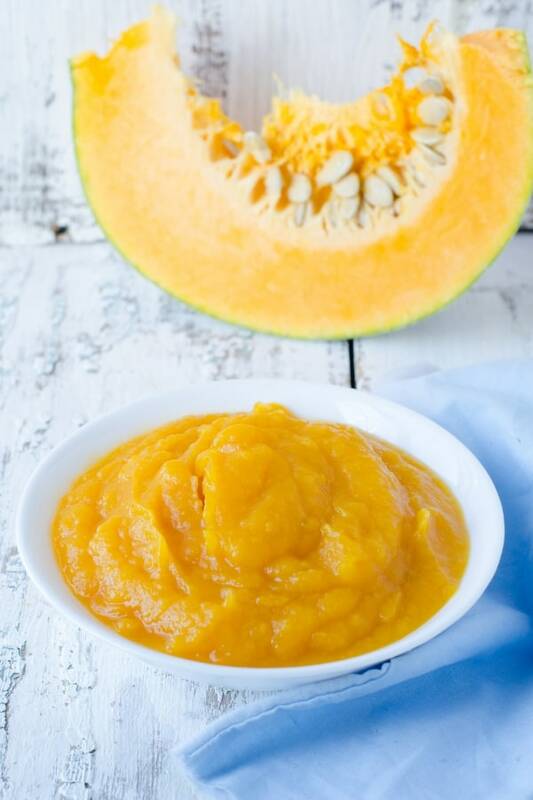 Whether you’re using fresh or canned pumpkin, odds are you’ll have some leftover puree after using some in a recipe. Luckily, leftover pumpkin keeps very well. First of all, even if it’s leftover canned pumpkin puree, you’ll want to store the leftovers in a glass or plastic container, which can include a plastic food storage bag. As long as you don’t leave it sitting out for an extended amount of time, pumpkin puree should last about 5 to 7 days in the refrigerator. Pumpkin puree also holds up very well to freezing. Place the pumpkin puree into an air-tight freezer safe plastic or glass container or in a heavy-duty freezer bag that you get as much air out of as possible. If you tend to only need a small amount of pumpkin at a time, you can even first freeze the pumpkin puree in ice cube trays and then place into a container and back in the freezer to easily thaw a small amount at a time. Frozen pumpkin is said to have the best quality taste and texture if used within 3 months but will still be good for several months after that. Here are several savory pumpkin recipes to use all that puree in. Pumpkin, Haloumi, and Avocado Salad – I don’t think I’d ever get tired of eating this fall salad. Smoky and Sweet Chicken and Pumpkin Corn Chowder – Who doesn’t love a good soup in the fall? 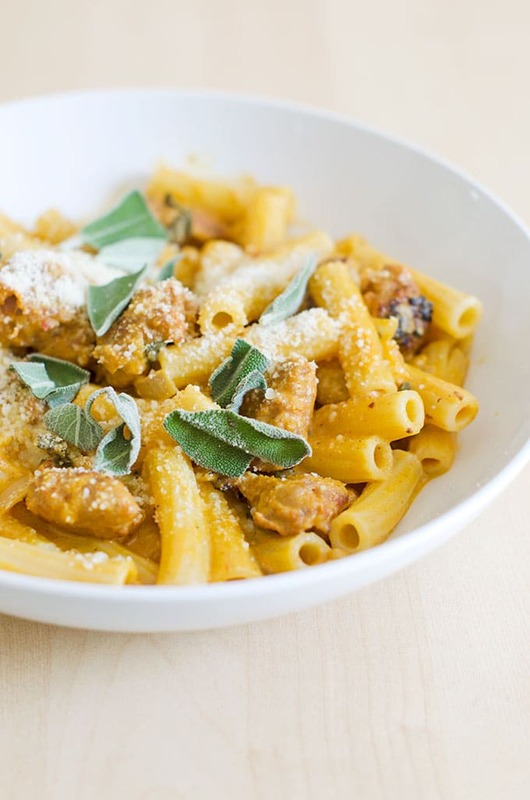 Rigatoni with Spicy Pumpkin and Sausage Sauce – This is so good – I’ve even been told it’s restaurant quality! Vegan Pumpkin Chili – And it only takes 30 minutes to make. One-Pot Creamy Pumpkin & Bacon Pasta – I’m all about fewer dishes. And bacon. Pumpkin Soup with Maple Spiced Whipped Cream – The perfect starter to any meal. Pumpkin Macaroni & Cheese – Take your favorite comfort food up a notch. Pumpkin Chili – With both mushrooms and beef, this pumpkin chili is extra hearty. Pumpkin Cheese Soup with Garlic Basil Cheese Crisps – Double cheese deliciousness? Yes, please! Vegetarian Pumpkin Posole – Another great dinner idea for meatless Monday. Thai Pumpkin Red Curry – Love that this one is made in the Instant Pot. Lentil and Pumpkin Meatloaf with Carrot-Potato Mash – What an interesting way to make a meatless meatloaf. Pumpkin Rolls with Salted Maple Butter – This one is going on the to-make list. Spiced Pumpkin Basil Cheese Ball – This one is even vegan and dairy-free! White Cheddar Pumpkin and Sage Dip – Looks like the perfect fall appetizer. Indian Pumpkin Flatbread – I never would have thought to add pumpkin. Delish! 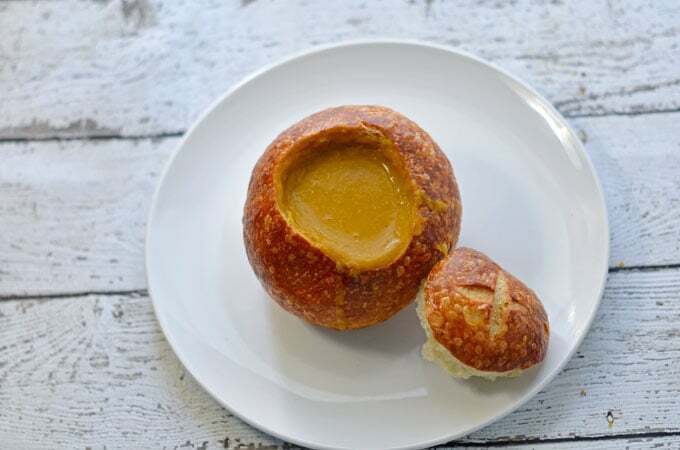 No Knead Instant Pot Pumpkin Rolls – What a smart idea to use an Instant Pot for bread rising. Pumpkin Dip – Love all the warm spices in this dip. Pumpkin Sage Focaccia – The caramelized onion topping sounds divine. Pumpkin Garlic Knots – These would be perfect with some pumpkin pasta. Pumpkin & Olive Oil Pull-Apart Rolls – So easy to put together while still looking scrumptious. Healthy Pumpkin Bread with Walnuts – This has to make some awesome sandwiches. Vegan Whole Wheat Pumpkin Drop Biscuits – I think these would be a nice change from sweet potato biscuits. 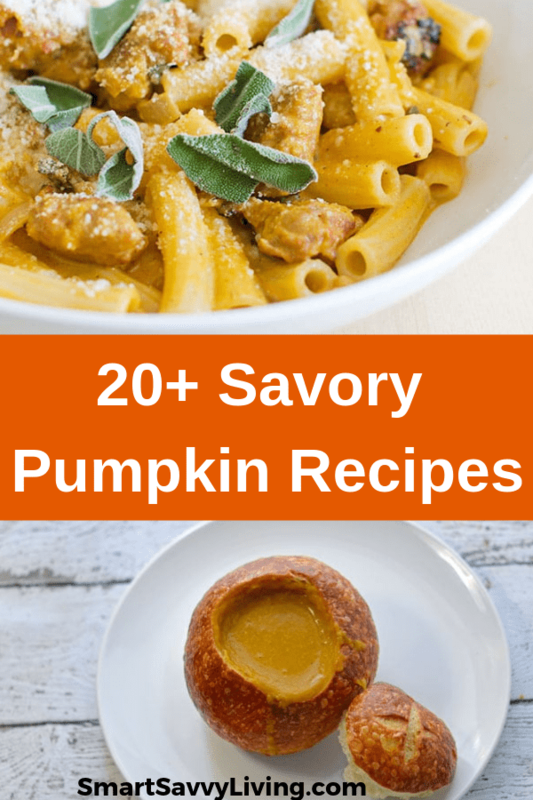 What are some of your favorite savory pumpkin dishes to eat?